The morning was crisp and bright with light winds and moderate temperatures. Approximately fifteen people showed up Saturday morning for the bird walk at Hughlett Point NAP. While I may have been running late in getting there, I was treated to a fabulous sight as I turned off 200 onto Shiloh School Rd. There was a large bird on some road kill about a half a mile down the way. At first I suspected a Turkey or Black Vulture, turns out I was wrong. Sitting in the field where the mysterious bird flew off to, was a juvenile Bald Eagle, she or, maybe, he had been dining on a poor raccoon that failed to make it all the way across the road. You never know what lies around the next bend, unless you go around the next bend. I did arrive early enough for some small talk in the parking lot. After a few minutes I went down to the shore to see the gathering of Tundra Swans, over 75 of them just sitting off shore. Along with them were several hundred Canada Geese and few other waterfowl. We spent several minutes scanning the cove for birds. Some other species that were noted were two Bald Eagles perched in trees close to the water on the far side. A few were fortunate to make out some Brant Geese among the Canada Geese (unfortunately I was not able to see one of them, as I do need them for my list). Along with them, were a few American Widgeon, several Mallards, a couple different gulls and a dozen Surf Scoters. The mere mention of which turned into a small debate on the proper pronunciation of scoter. Naturally there were several camps, a few suggesting it sounded something closer to a man’s name, “Scott.” Then we heard it rhymed with “Boaters,” (the group I belonged to, although I never heard it put that way). There may have even been a scooter in there as well. The conversation quickly turned to identification marks and what made it a surf scoter as compared to a black scoter. In the end several people were able to add Surf Scoter to their life list. Their excitement was at least contagious to me and, at this point, we were stretched out in a long broken line heading down the beach towards the point. 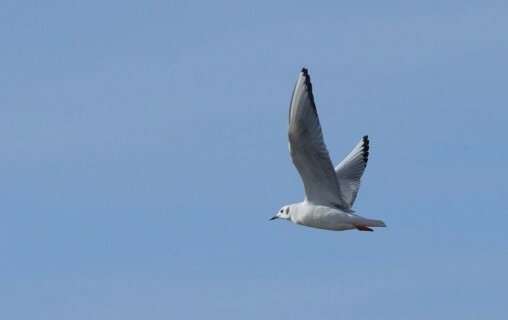 As I walked along, I noticed a small tern/gull like bird flying gracefully along the dunes. I watched for a while and then tried to get a few photos of this small unidentifiable bird. I asked if anyone was aware of what species it was and alas I was introduced to the Bonaparte’s Gull (#203 on my life list). I was also given a quick rundown on identification marks and what to look to for (in that plumage), so I may recognize them in the future, if I encounter one or two along the way. As we made our way to the point, a small group of Sanderlings flew low and in a tight formation eventually landing there. Along with the Sanderlings, it was apparent there were also some Dunlins thrown in the mix. There were two spotting scopes that were used to take turns observing them in the tidal mud flats, bobbing and weaving or stitching along, as they searched for a meal. Off in the distance a kettle of vultures flew about, several Turkey and one Black Vulture were reported. There was also the clamor of American Crows from off in the trees. As we approached en masse a few Mallard ducks took flight. I watched as they flew out over the bay made a wide circle and returned once again, flying off to the north east. Taking a cue from the mallards, we headed back to the parking lot, opting for the path that leads to an inland trail which weaves through the trees. As we made our way down the pathway, we were treated to a small flock of Yellow Rump Warblers or referred to by, la Presidenta as, “Butter Butts.” While observing the Butter Butts, several Cedar Waxwings flew into a tree overhead. In my opinion, they are one of the prettiest birds in North America. In addition to the Butter Butts and Waxwings, there was also an appearance of a Northern Cardinal. All in all, it was a great morning to walk around Hughlett Point NAP. Hope to see many of you on the next Bird Walk, February 12th at Bethal Beach NAP.